All transactions are safe and secure with a reliable history in online purchasing behind each of our associates. Buy the Bumblebee Transformers t-shirt to own Transformers clothing and merchandise. More than two decades before the dream of a Transformers live-action movie would finally become a reality, an animated movie was released into theaters. The year was 1986 and the Transformers cartoon was at the peak of its popularity. Orson Welles, in his final film role, provided the voice of the animated movie's villain Unicorn, which threatened to destroy the Autobot's home planet Cybertron. 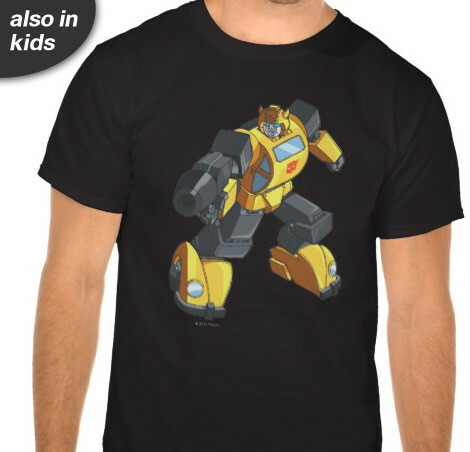 This Bumblebee Transformers t-shirt displays the Autobot as he appeared in the 1986 animated Transformers movie. The updated live-action movie version is displayed below in the form of an action figure. In addition to the Bumblebee Transformers tee above, browse the Transformers Clothing Gallery for more apparel like men's and women's clothes, kids shirts or hoodies.